Flower Burst enjoyed at our Purcellville Tasting Room in Loudoun County Virginia. Flowering Teas are not only a good cup of tea but a beautiful piece of artwork. These relative new comers to the tea world require little work from the brewer and a clear glass teapot to truly enjoy. Flowering teas, or blooming teas, surfaced in the Chinese market in the 1980’s and started to make it into the US in noticeable volume in the 1990’s. These teas are a combination of tea leaves and flower petals that are sewn together in a pattern to create a flower when steeped in hot water. Always hand tied, these teas originated from the Yunnan province. 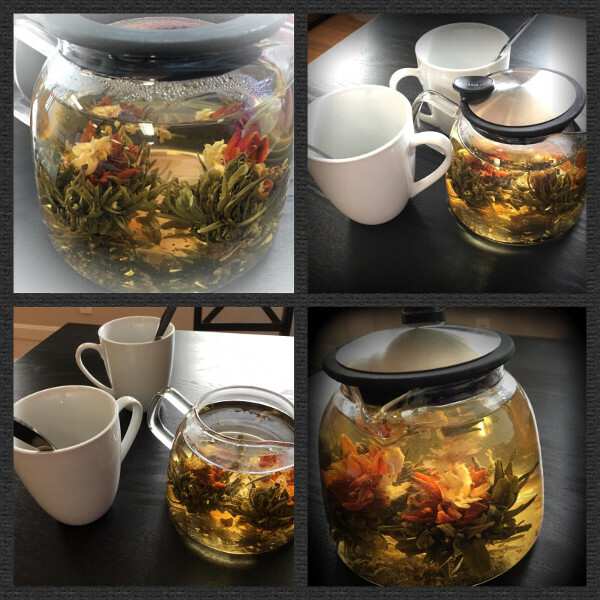 In choosing the flowers and tea leaves, the tea company focuses on the wow factor of the bloom opening and the color contrasts along with the flavor. Typically green tea is used as the base to create what will become the leaves of the flower. The tea may or may not be jasmine scented prior to being sewn together. The artists making these are working with wilted leaves that have not been baked yet, so there are a lot of possibilities on how they introduce flavor into the creation. Usually they are working with older leaves as they will hold up to the sewing and molding into shapes more than the younger. Once the base is in place, using cotton yarn, they will stitch in the center flowers working from the outer flower petals into the center. Common flowers for this are jasmine, chrysanthemum, osmanthus, lily, hibiscus, and amaranth. These flowers impart their own scent and flavor to the tea. The creation is baked and slowly formed into the bud. 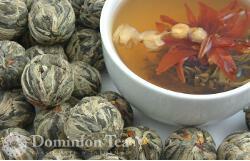 Flower Burst tied flowering tea. To enjoy a flowering tea, you really need a clear glass tea pot. 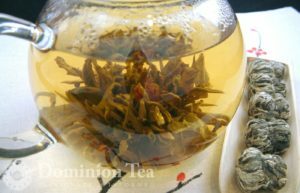 Since you are working with a green tea and flower petals, you will need water in the 175-185 degree Fahrenheit range. Place the ball in the pot and then fill with water. The ball will float because of the air pockets formed in the ball while it was being stitched together. With time, the ball will absorb in enough water to start to sink. You can help it along using a spoon or chop stick to hold down the ball. Once you see air bubbles leaving the ball, you should be all set to allow the ball to sit and open. This can take anywhere from 5-10 minutes. Once the ball opens, feel free to pour yourself a cup of tea. So once you have enjoyed that pot of tea, you can use the open flower as a decoration. Grab a glass vase or cup large enough to allow the flower to remain open in the bottom. Put the flower in the bottom and add enough cold water to allow the blossom to be fully covered. Add 2 tablespoons of white vinegar. The vinegar will slow the browning of the flower petals. You will need to change the water about every 3 days and the flower will stay for about 2 weeks before fading becomes very apparent. If may be less if kept in a spot with direct sunlight. Add flowering teas to your tea collection and enjoy a beautiful center piece as well as a good cup of tea.